The Warriors play with a zest and a joy for the game that is contagious, has attracted an untold number of new fans and brought them almost universal acclaim as being one of the greatest teams in NBA history. In fact, this past season they won more games than any other team in an NBA season. What do the Warriors do differently? First of all, the Warriors built their team from the ground up, using the NBA draft as their primary staffing resource, rather than trying to make a series of trades to try and find the right mix of players. The personnel moves they made were highly considered and often spectacular; for example they selected Steph Curry, the unanimous MVP, after six other teams had passed on him. Secondly, they hired a coach in Steve Kerr who had instant credibility, was a master communicator and recognized that the key to future success was establishing a culture where everyone was involved, felt valued and understood their roles and responsibilities. When important issues came up, such as whether the team should try and focus on breaking the record for most victories in a season, he asked the players how they felt about it. This sent a strong message to everyone on the team that they were valued and their input was desired. Coach Kerr united everyone around the mission (winning) and got the players to subjugate their own interests for that of the team, not an easy thing to do when every NBA team is comprised of players who for all intents and purposes are corporations. He also encouraged everyone to enjoy the ride, so when things went a bit haywire, he (or his chief assistant, Luke Walton) often reminded everyone to find the joy together. Finally, they placed a heavy emphasis on improving their systems and processes, by relying on analytics, tracking their players’ health, giving performance feedback, etc., in order to ensure that everyone had a laser-like focus on the bottom line, and the results speak for themselves. It is a generally accepted principle that innovation usually comes from outside the industry you are working in. That is because new knowledge often comes from the intersection of different knowledge domains and the Warriors’ success offers us the opportunity to learn from them. The corollary to that principle is that if you want to change your results, you need to change your design. That is exactly what the Warriors did. They recruited the right players and the right coach, then created the right atmosphere and reinforced everything they were trying to accomplish by redesigning their systems and processes as needed. As a result, they created a spectacular team and became a worldwide phenomenon. Shouldn’t government officials want to learn from them and take a similar approach? Granted, managing a professional basketball team is not exactly the same thing as running a day-to-day government operation. A basketball team plays 82 games per year, not counting the playoffs and during each game the coach needs to make a series of substitutions on the fly, adjust the team’s strategy and tactics as the game progresses, etc. I don’t see a basketball head coach being able to delegate those tasks to a team. By contrast, government officials don’t manage from game to game; their focus is on achieving the overall performance goals set by their agency. However, within that context, they generally have the opportunity to do what the Warriors do and in addition, delegate the tasks handled by the Warriors’ coaching staff to their teams. That is because both the work and the conditions and circumstances are different and lend themselves even more to building mature teams. In other words, they can take the team of leaders approach even further than the Warriors and teach their teams to deal with personnel issues, set the strategy, manage performance, hold each other accountable, etc. Imagine operating like the Warriors but with your teams having more autonomy, more authority and even more flexibility. 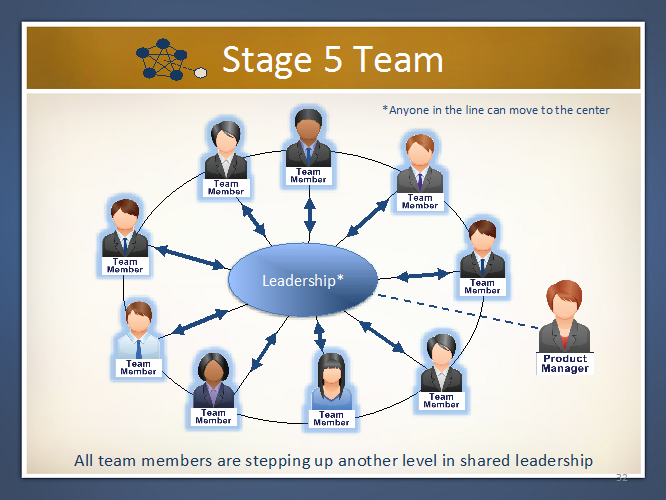 What is a Team of Leaders? 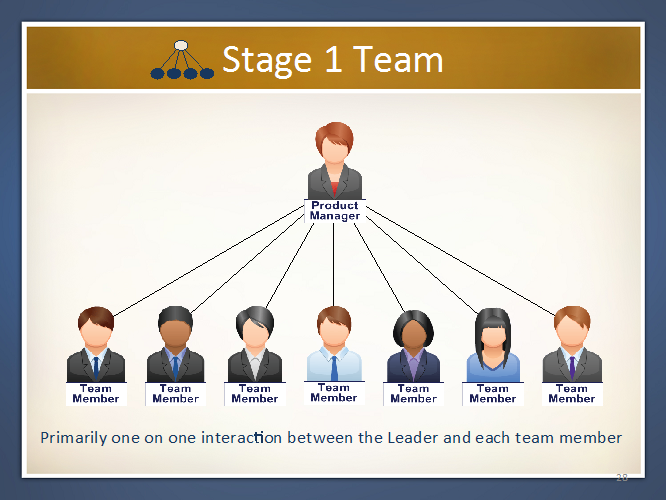 A team of leaders is a cohesive group of employees who manage their entire operation as a self-contained unit, and operate as if they are co-owners of the entity. Such a team is comprised of highly engaged and committed employees who can outperform a typical unit by as much as 2.5:1. 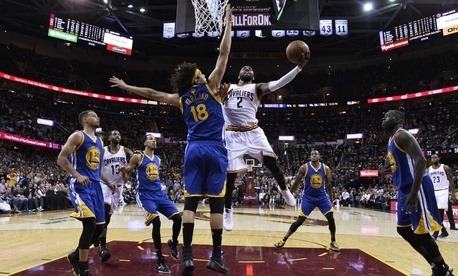 This will only happen if such a team is carefully designed, built, supported and developed and works within an integrated series of systems, processes, tools and techniques to succeed—just like the Warriors. Typically a traditional government work unit has a boss at the top of the pyramid making all of the key decisions, with subordinates simply doing what they are told. Under this design, employees are 1) made to feel as if they are merely cogs in the wheel, 2) almost always in a reactive mode and 3) easily replaceable. As such, they tend to feel like second-class citizens, causing them to be disengaged and uncommitted. The supervisor is no longer the driving force behind the team—the team itself is, and each member can step up and provide leadership as necessary. This then frees up the supervisor to perform higher-level work, and thus provides the organization with crucial resources that it rarely can tap into. The point here is that you can replicate at least some of the Warriors’ magic, but you need to do it a way that makes sense for you. Other award-winning organizations are benefitting from such an approach. Why not you? Stewart Liff is an HRM, visual performance management and team development expert. He serves as a Fellow with the Performance Institute and is the President and CEO of Stewart Liff & Associates, Inc. He is the author or co-author of seven books, including Managing Government Employees and A Team of Leaders. He can be reached at stew@stewartliff.com.